The Skoda Octavia confirms it is the favourite nameplate of Croatian buyers. Thanks to our new partnership with local outlet Promocija Plus, we can share with you today Croatian data for January and the news are excellent: up a whopping 30.8% year-on-year to 3.706 units. Volkswagen trails the market slightly at +26% to 14.2% share and only owes its pole position this month to a meagre 5 units above stablemate Skoda surging 111% to 14.1%. Suzuki is up 80% to #3, Renault up 60% to #4, Opel up 47% to #5, Dacia up 100% to #7, Ford up 35% to #8 and Audi up 42% to #10. Mitsubishi (+220%), Smart (+175%), Mini (+120%) and Mazda (+36%) also shine. 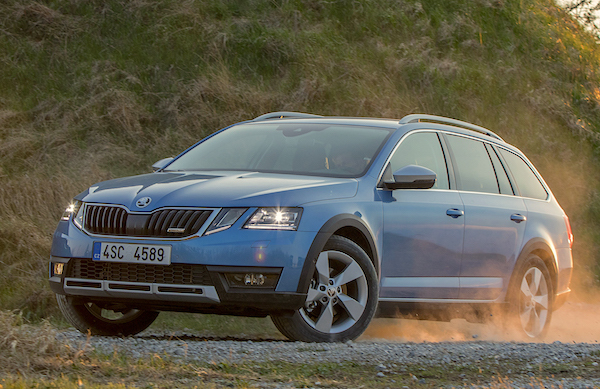 Leader in 2017, the Skoda Octavia almost triples its sales year-on-year (+188%) to hit a very impressive 8.1% share in January, followed by the VW Golf (+75%), Suzuki Vitara (+5%), VW Tiguan (-12%) and Dacia Duster (+335%). The Ford Kuga (+3450%! ), Suzuki SX4 S-Cross (+379%), Renault Megane (+169%) and Skoda Rapid (+121%) also impress while the Peugeot 3008 breaks into the Top 20. Full January 2018 Top 33 All-brands and Top 20 models below. Croatia Private Sales Full Year 2012: Citroen C4 most popular!